Our Trade Stand presence at RHS Cardiff holds fond memories for us, largely because we won an RHS Trade Stand Presentation Award in our first year. The first RHS Flower Show of the year - and our first Trade Stand with the RHS - is held at Bute Park. 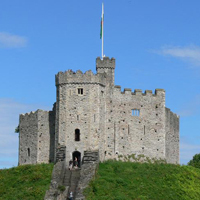 Just a short walk from Cardiff city centre and the castle the park receives well over 1,000,000 visitors each year. It has played a role in the development of the city we know today since Roman and Medieval times and was handed over to the people of cardiff by the 5th Marquess of Bute in 1947. 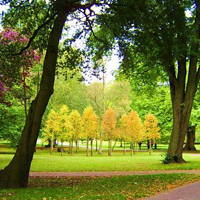 It has great national importance, not least because of the Arboretum that holds over 50 UK Champion Trees. 2014 was the Tenth Anniversary of the RHS Cardiff Flower Show so we had a torrent of visitors to the Trade Stand - which was a real buzz. The show at Bute Park grows in popularity year on year and last year attracted record crowds of over 22,000 people. Interestingly, particularly from a horticultural perspective, Capability Brown worked on the Castle Green in the 18th Century. 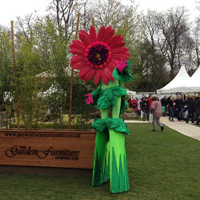 We'll be exhibiting the best in our range of High Quality Garden Furniture at the forthcoming Cardiff Flower Show. Hand Woven Rattan Furniture Sets. 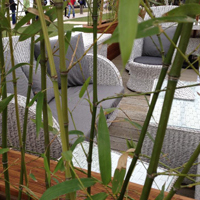 We have a huge array of different designs and sizes of outdoor rattan in our on line catalogue and we pick the cream of the crop for display on our Trade Stands at the RHS Shows. Sumptuous outdoor cushions available in wide range of colours are sold with all our outdoor sofa sets. many with quality fabrics from the likes of Olefin. Two of the most popular are the Montana Water Hyacinth Suite and the Monte Carlo with Rope Weave from ViroFiber - totally modern and totally contemporary. From Roma Cantilever Parasols to our range of Bambrella and Diamond Teak Parasols we guarantee you won't be disappointed. Olefin fabrics are used for many of the canopies and these are also replaceable. We always take a range of high quality bases with us as well that are sold seperately. All our Teak tables and Chairs are hand crafted from the highest quality A Grade and Reclaimed Teak. There's something for every size and style and taste - guranteed to last for years. A lot of our Reclaimed Teak Furniture is conssidered to be antique in nature. From the contemporary Four Seasons Gazebo to our luxury Riviera and Deluxe Gazebos we've always got at least one on display on our Trade Stands. We also sell replacement parts so a one time purchase can be refreshed over and over again, year in year out. Handy for when it rains as well! If you require further information about our presence at The Cardiff Flower Show please feel free to speak to our Sales Team in the Midlands.